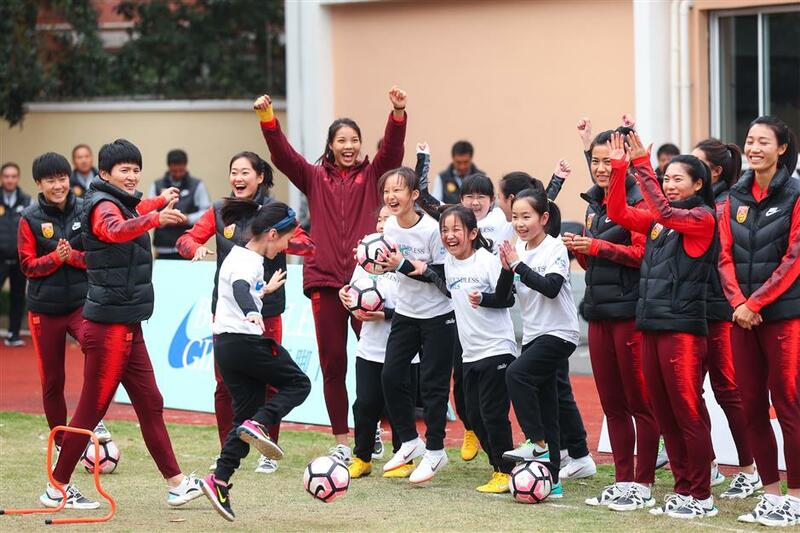 Chinese women's national team players interact with students of Shanghai Hangzhou No. 1 Road Primary School on Monday. The Chinese women's national team is all geared up for the 2019 FIFA Women's World Cup, which will be held in France from June 7 to July 7. "We are ready and can even start playing the tournament now," head coach Jia Xiuquan said when asked how well prepared his team was. "We will continue to work on the details in the next two months and try to present a perfect performance then." Jia and some national team players attended a new jersey unveiling ceremony in Shanghai on Monday morning. They went to Shanghai Hangzhou Road No. 1 Primary School in the afternoon and interacted with students there. China, 15th ranked in the world, is in Group B together with Germany, Spain and South Africa. Its first match is against world No. 2 Germany on June 8. "It's a fine draw for us. It's not that important who is in our group. As long as we prepare ourselves to the best, we can beat any strong opponent. But, if we don't have the desire for a good result, we may well lose to a weak side." "To become world champion is always our ultimate goal," Jia said when asked about his target for the tournament. "I hope we can play our own game and achieve some breakthroughs." The women's national team proved its mettle last year by finishing third at the Women's Asian Cup and also took silver at the Asian Games. "The girls showed incredible spirit and form during the Asian Games. I hope they can carry that into the World Cup," said Jia. The coach said he hopes more players will get a chance to go abroad, playing in countries where women's football is better developed, like Wang Shuang. The 24-year-old midfielder is currently playing for French side Paris Saint-Germain and was named Asian Football Confederation Women's Player of the Year in 2018. "High-quality overseas experience will help players grow quickly, especially their mind power, which has already been proven in Wang Shuang's case. I hope more girls can go out and play in good leagues. "We know that the United States and some European countries are making quick progress regarding personal ability of their women players. I want my players to give full play to their potential so as to follow the world's pace and not get left behind," added Jia. At the 2015 World Cup in Canada, China advanced to the knockout stage and was eliminated by the US in the quarterfinals. The Americans beat the Japanese in the final to become champions. "Beating host Canada in the opening group-stage match was still a memorable experience for me," said captain Wu Haiyan, who also led the team at the 2015 World Cup. "We are a more mature team now compared to four years ago. Personally, I have improved, both technically and mentally. We are looking forward to a better result this time."